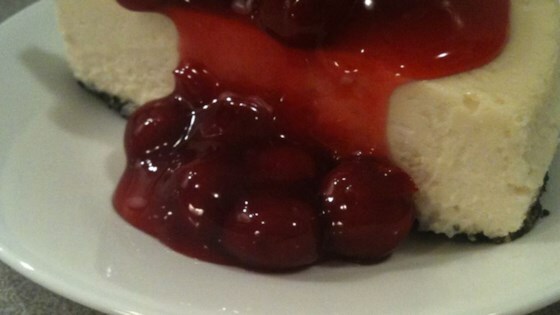 "This is a very creamy cheesecake. It's delicious plain, or you may top with fruit pie filling." Cream together cream cheese and sugar. Add eggs one at time, blending well. Add vanilla and sour cream. Pour into shortbread crust. Bake for 60 to 70 minutes in the preheated oven, or until cake jiggles evenly across the top when lightly shaken. Run a knife around the outside edge, but leave the cake in the pan. Let cool on counter, then place in refrigerator. Remove from pan when completely chilled, and serve. Banana cream dreams do come true! Very easy to make, but does tend to crack, so if you are serving it for a dinner party, use a topping.